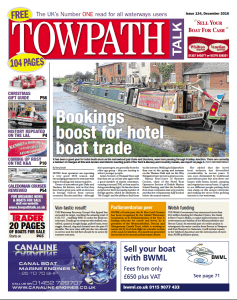 Glad tidings we bring in the December issue for canal boat enthusiasts and businesspeople – things are looking bright for 2017 after a busy 2016. 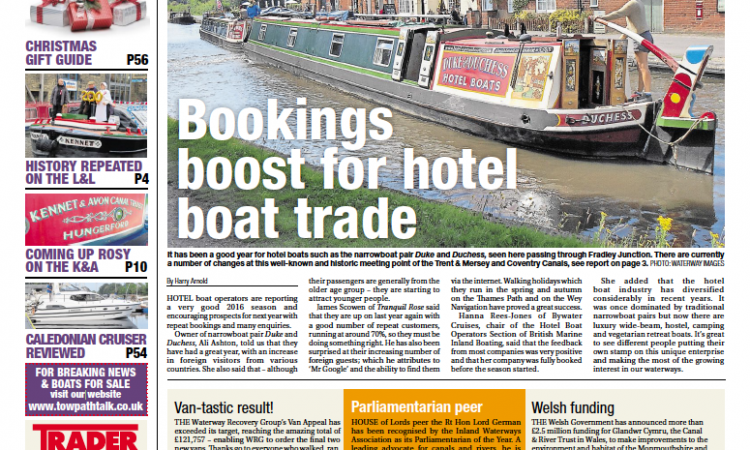 Hotel boat operators have reported a buoyant 12 months, possibly due to more people opting for ‘staycations’ on British waters, and the wide variety of opportunities to holiday at a leisurely pace has given a welcome boost to the waterways tourist trade. The latest issue also contains great news for a little dog who’s become a children’s TV star. Terrier Chico and his adventures on the waterways in the Midlands and Wales have scooped a Royal Television Society award for the show’s producers, Chugg Productions. Find out more about the show, Chico Chugg, which is called Nico Nog for viewers in Wales, inside our packed December newspaper. Children and adults alike turned out in force in Blackburn to celebrate the 200th anniversary of the Leeds & Liverpool Canal – we’ve a full report and lots of colourful pictures. 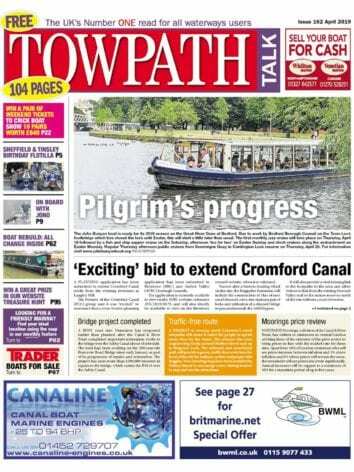 Numerous other canals feature too; there’s news of the Grantham Canal Discovery Day, while editor Janet Richardson takes a trip on the Rose of Hungerford on the Kennet & Avon, and the Wey & Arun Canal Trust enjoyed a memorable weekend as part of the canal’s 200th anniversary. Outstanding writer Phillippa Greenwood paints a stark but inspirational picture of the lives of those who toiled to create the Standedge Tunnel that burrows through the Pennines, her words complemented by evocative images of this dramatic landscape from Martine O’Callaghan. We’ve a delicious recipe to offer those seeking a vegetarian Christmas dinner option, lots of readers’ letters, and boat horse Cracker’s monthly mutterings about life on the Monty as well as a Christmas gift guide and 20 pages of boats for sale! So if your new year’s resolution is to holiday in Britain, you’ll find lots of helpful hints, tips and advice in this busy issue to banish the winter blues and help you look forward to the next boating season. Next Post:January 2017 issue out now!